Forest owners have been paying Whanganui District Council rates for 25 years and all they want in return is the roads to bring their logs out, Peter Lissington says. He works for New Zealand Pine Management, which has 7000ha of forest in the Whanganui District. It began planting in 1994, with the council and central government welcoming the investment. The forest owners have paid about $100,000 a year in rates, subsidising services for others in the district. They don't want to pay an additional levy to maintain rural roads, Mr Lissington said. He's worried the council is discussing a levy without involving forest owners. But he's mistaken, Whanganui councillor Alan Taylor said. There are no "secret meetings" and some forest owners are already engaged and have suggested a levy. He agrees that the council "wooed" forest owners in the 1990s, and acknowledges it has ignored rural road maintenance for 12 years - an act of "economic vandalism". 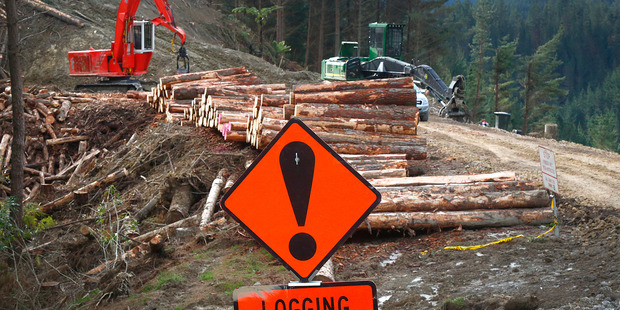 There are 30,000ha of logs to be taken out over the next 30 years, Mr Taylor said, and forestry does 90 per cent of the damage to rural roads. It brings out more tonnes of product than any other rural industry. There's a $2 million a year shortfall in the rural road maintenance budget. "The rate levy is nowhere near the level required to cover the cost." The cost to foresters will be "scary", he said, but they should have expected it. "If they never expected to have to pay for the damage to our roads then they have been very naive." The council is considering increasing rates for forest owners, and imposing a per tonne levy as logs are removed. It could also restrict harvest times and restrict where new planting can be done. No decisions have been made yet, and Mr Taylor said forestry interests will be consulted before they are. Trucking companies pay road user charges, and Mr Lissington said councils should get some of that money back for road maintenance. Mr Taylor said councils do get some, in the form of government subsidies of 62 per cent for most rural road maintenance.